Continue reading "Book Published: Microsoft SQL Server 2014 Business Intelligence Development"
Continue reading "Book Published: Microsoft SQL Server 2012 Integration Services: An Expert Cookbook"
Finally the SQL Server MVP Deep Dive Volume 2 going to be available soon . This book is all about SQL Server, but not an ordinal book about SQL Server from begin to end or on special aspect of SQL Server. This book covers 5 major topics of SQL Server ( Architecture and Design, Administration, Database Development, Performance Tuning and Optimization, and Business Intelligence ). 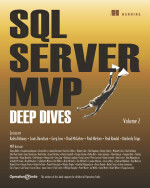 Over 50 SQL Server MVPs contributed in writing this book.